There are some quick initial indicators of a healthy cat that are useful to know. Although, to be honest, if we are close to our cat (as we should be) and involved with our cat or cats we will know fairly quickly if something is wrong. Or at least we will have a suspicion because cats are good at hiding illness. It is said that cats hide illness as a survival instinct. If an animal appears weak it is more likely to be attacked. A cat’s instinctive behavior originates in the behavior of its wild ancestor the European wildcat and/or African wildcat. The source material for this article is myself and pages 48-52 of The Cat, Its Behavior, Nutrition & Health by Linda P. Case. 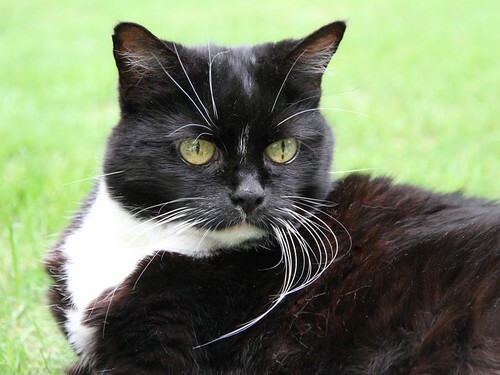 Healthy old lady cat – 18 years my companion – photo by Michael, Aug 2010. There would seem to be several vital indicators that can provide us with a quick check on our cat’s health. These are “physiological constants”; body functions that remain the same and if not they provide a sign that something might be wrong. Eating habits. Have these changed. More usually (but not exclusively) has your cat lost appetite? I refer to the above incident. Skin and coat. Is your cat grooming normally? Has the coat got its normal shine? Is the skin pliable and clean? The coat and skin are good indicators of a cat’s health. Body weight. We are usually aware of a change in body weight and for me it is commonsense what a normal body weight should be, but see: healthy cat weight and obesity in cats. Cat age has a bearing on body weight. Old cats losing weight is a concern. A cat of correct body weight should have a “lean body condition”1. Body temperature. We can’t see or feel this but it is something that we can check at home if we have the commitment and will! This should be between 100.5º to 102.5ºF (average being 101.5ºF). See Cat Temperature. Pulse rate. Once again we can’t see or normally feel this but we can check it as a home diagnostic tool (see below). See Normal Cat Pulse. Respiration rate. In other words is our cat breathing irregularly, fast or slowly? The norm is approximately 20 – 40 inhalations per minute. Activity levels. Is your cat unusually quiet? Has he or she “holed up” in a quiet place? This I feel is a pretty good sign that something is wrong. Recently my old lady cat was spending long periods outside under a bush. OK it was hot and why not? But it felt wrong and she was definitely off colour as she lost her appetite and started to lose weight. She has now recovered so it must have been a cold or some such transient illness – thankfully. Toilet habits. The other side of the appetite debate. I believe that we can tell when something is wrong from a change in toilet habits, and from what our cat produces. I won’t go into detail but doing the litter daily or twice daily allows us to monitor this constant. For some pointers to the cause of symptoms of illness you can see cat illness symptoms or the main cat health problems. Of the above “checks” maintaining a good appetite is one of the clearest and most obvious indicators of a healthy cat. Increased appetite can indicated the early stages of sugar diabetes (diabetes mellitus), a diet being too palatable, a spoiled cat, non-absorption of nutrients due to diarrhea, or hyperthyroidism (normally associated with old cats). These are only some examples. Alternatively a decreased appetite might indicate the later stages of diabetes, sore mouth, many diseases cause loss of appetite quite naturally including: cancer (e.g. feline fibrosarcoma), infection (viral and bacterial – e.g. sneezing), kidney/liver disease, FeLV, FIV etc. Obesity in cats is more common in the Unites States than being underweight. At 2003 it was the most common “nutritional malady” seen by the vets1. That is probably still the case. This is due to simple overeating and lack of activity in the majority of cases. Obesity it is said can cause diabetes and hepatic lipidosis. Some vets think that the problem of obese cats is at least partly due to commercial cat food, particularly dry kibble which is high in carbohydrates to make it palatable. It is an unnatural food for a cat but convenient for us. This is something we should be aware of. Convenience for us can translate to not doing the right thing for the cat. Declawing immediately springs to mind as another example. The best dry cat food in the US is Innova Evo dry cat food, so I suggest! I try and assess the best canned cat food too. A cat of correct body weight should have a “slight indentation in the loin area” when viewed from above1. We should be able to feel the cat’s ribs easily without having to feel through a layer of fat. As mentioned one of the first indicators of a healthy cat is correct appetite and accordingly suddenly decreased food intake or anorexia may well be a sign of illness. A cat losses body heat mainly through respiration and the evaporation of saliva deposited on the fur when grooming. When a cat is stressed or in acute pain it might pant like a dog. A cat can lose some heat through sweat glands on the paw pads. Fever can cause an elevated body temperature. Cats with a fever will conserve heat by curling up and/or finding warm places. A fever for more than 2 days or an elevated temperature 103ºF to 104ºF should be dealt with. Care should be taken when transporting a cat in a car or carry case as high environmental tempera tures can cause severe illness and even death. 1. The Cat, Its Behavior, Nutrition & Health page 50.